The future is calling and we must go. How do you want to spend your life? Here at Axon, we think how you spend your life matters so we put a lot of consideration into the culture we are creating and the values we want to strive for as we build the future. As we explore our values, it's important to first ask why companies exist. One might assume (and might even be right in some cases) that the sole purpose of a company is to make money. Our company's primary motivation is larger than profits or products, although both of these are important and necessary components of good organisations. We firmly believe that the best organisations create a unique contribution to society. The great ones are focused on something different. Usually that something is an area no one else is focused on, and they do it in a way that is so impactful the world has to take notice. There are a million different technology companies that look nothing like us. To explain our unique contribution we must look to our origins. After seeing a local news clipping about a man stunned by electricity, Jack Cover, a former NASA scientist, was inspired to invent a weapon that could incapacitate people with electricity, naming it after a book from his favourite children's fiction series: Thomas A. Swift and his Electric Rifle. The TASER device floundered in obscurity for two decades until our founder and CEO, Rick Smith, looked up Jack Cover after two of Rick's friends were killed in a road rage incident, and Rick was left thinking ‘there must be a better way’. The two paired up and commercialised Jack's invention. Since TASER International's founding in 1993, the company has saved over 175,000 lives from death or serious injury. Starting in 2008, the company expanded its focus from smart weapons to also include smart devices, namely wearable cameras, for public safety. The company's focus has continued to evolve over time from smart devices to building a comprehensive software platform, and now, the Axon network will be much larger than our original TASER business. With the future in mind, last week we officially changed the name of the company from TASER International to Axon. The TASER brand will live on, but instead of being the company name, it will now be the brand for our TASER Smart Weapons, something that it is already ubiquitously associated with. The TASER weapons are still a core part of our strategy and a key device in the Axon network. The new company name, Axon, reflects the broadening of our focus and allows us to aim far in the future. As we look to the future, we want to create the right values to help us achieve our long-term vision and build a lasting enterprise. These values guide who we bring on to the team and how we steer the company. We breathe and bleed these values and hold each other accountable to them by giving immediate feedback when we falter. We strive to weave them into every aspect of our quest to create a better future. Be Obsessed: Walk with the customer as you transform their world. We believe it all starts with creating a great experience for the customer. We would never want to develop or sell something that the customer doesn't want or need. We're obsessed with creating real value that solves real problems that people are willing to pay for and use. Most importantly, this means creating value in a unique way that no one else can, ultimately creating something much better than any competitor could and striving to give the customer the absolute best experience. This is more than just listening to customers – it's anticipating their needs by mapping technologies to insightful opportunities. In everything that we do as a company, if we can't trace it back to something that involves benefiting the customer then we cut it. Aim Far: Think big with a long-term view. We want to push society forward in ways that they can't imagine. We're passionate about finding value in unexpected places and are relentless in aiming for the future. We don't want to be the fifteenth or sixteenth player in a space. We want to reinvent the world to be a better place and understand the short-term risk of that enterprise. The opposite of success isn't failure, it's not trying. We've failed spectacularly a few times, but that's what you get when you aim for the stars, and that's our final destination. Win Well: Win with integrity. We are fiercely competitive and have an unquenchable thirst to win, however we temper that mindset and certainly do not have a win-at-all-costs mentality. We don’t think that winning and doing the right thing are mutually exclusive. Our challenge is to make them synonymous. Winning by cutting corners isn’t winning. We might miss a quarter or a product delivery date but we will never compromise our integrity. Put simply: Aspire to be the best and do so by delivering results with utmost integrity. Own It: Commit, take action and deliver. Perhaps the defining measure of any member of an organisation is taking ownership. If someone takes ownership of the execution, it's magical how infectious getting results becomes. We want directly responsible individuals who step up and take initiative. Be an owner and see things through to completion. 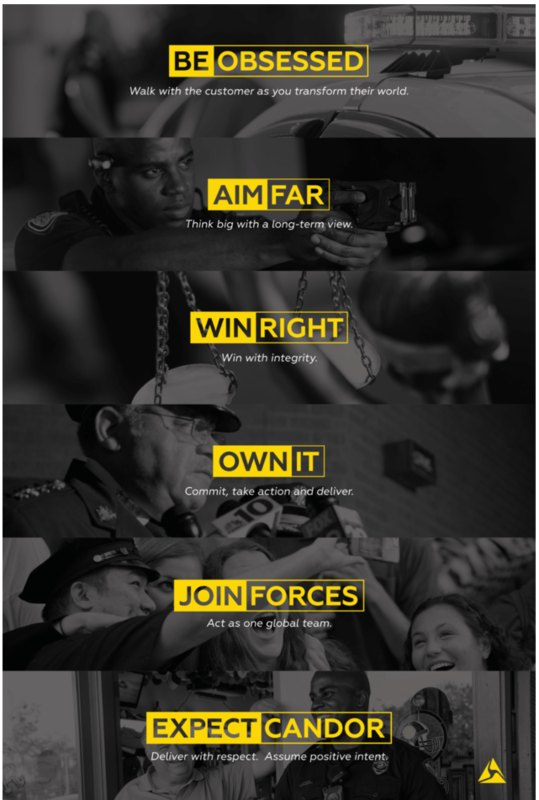 Join Forces: Act as one global team. Creating the future is a team sport. Teamwork is harder than it seems on the surface and, as our company scales globally in 40 different markets with multiple technology stacks ranging from wearables to cloud to high-voltage electronics, it requires a consistent commitment to operate as one team. We value eagerness to sacrifice personal interest for the team and someone who is voracious for team goals. As a global company, we must have an international mindset and invest in being good teammates who foster an environment of honesty, dignity, respect and sensitivity. We are one global team committed to an audacious vision. Expect Candour: Deliver with respect. Assume positive intent. We expect candour, but we don't always get it. Why? Because it's easier to keep quiet or not elevate the truth to try to make people feel better or avoid conflict. Despite being easier to avoid candour, we've come to believe that it's much better to address things up front in a candid, respectful way, even if it's not always comfortable. We believe that candour is important because it elevates critical issues or miscommunication to the forefront. Candour shines a light on misalignment and generates speed. Instead of burying ideas, waiting for them to explode when the train goes off the tracks, a candid environment allows us to get to the right answer, faster. For feedback to be constructive, the person delivering it must have previously proven that he respects, cares for and is trying to help the other person, and genuinely has positive intent. How can we be the best version of ourselves and the best company if we can't give and receive critical feedback? We are committed to every individual who makes up our team. We're not only interested in pursuing our vision and mission, but also in doing it in such a way that creates a purpose-driven journey for everyone in our company. The core essence of this is ensuring that people know that the work they do matters. In the Wright brothers' biography, there is a passage that describes a scene where the Wright brothers' nephew observed them working in their workshop. The boy assumed that they were just tinkering on bike parts and, only in retrospect, realised the historical magnitude of what he had observed – Wilbur and Orville building a prototype of the first glider. Like any major endeavour, our work, at times, can seem very ordinary. If we take a step back, it is anything but ordinary. We are a very unique company and no one else in the world can deliver the significant progress that we're committed to. We should never overlook the importance of the work we are doing. The products that we make are not a single answer to the complex societal tensions we feel today. We don’t presume to have a panacea for these very convoluted incidents. We are confident that we can be part of the solution, and countless scientific studies have shown that our products can affect and drive positive change. We are continually pushing society forward with technologies that protect life in new ways, from Smart Weapons that protect life in the moment of conflict, cameras that depict the truth and help prevent civil unrest, and automated reporting and evidence management that will triple the amount of time that officers can spend serving their communities. We must be part of building a better future. The world needs us. For more of Luke's thoughts on leadership and building a purpose-driven company, listen to this recent podcast he recorded for Y Scouts.